How Do Commercial Cleaning Contracts Work? If you are the owner of a cleaning company, it is just smart business to create commercial cleaning contracts for each of your customers. Since commercial cleaning is an industry where your employees will likely have access to expensive equipment, computers, and sensitive information, having a contract that addresses these kinds of things is essential. It’s also worth noting that cleaning can be highly subjective, so spelling out the details of the service will potentially prevent headaches down the road. As with any professional services contract, commercial cleaning contracts are legal documents that spell out the terms and conditions of the agreement between the two parties. Your monthly cleaning contracts can take on various formats but should include several key elements. You should describe the services you plan to provide, including the general cleaning services, plus any special services you are going to provide to each individual client. You can also add that you require background checks for all your cleaners to help make the client feel more at ease. There will be a minimum time period that the contract runs through, and you will need to state whether it is terminated at the end of that time or automatically renews. Some cleaning companies are fine with monthly cleaning contracts, but others prefer six months or even a year. You’ll also need to include how much notice is required to terminate the agreement. 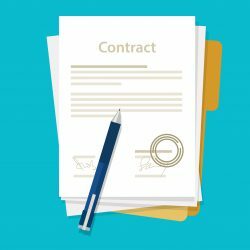 You should also add language that allows you to terminate the contract under certain conditions, such as breach of contract. Naturally, you will need to detail your rates on commercial cleaning contracts, plus lay out a payment schedule once an invoice has been issued. Some cleaning services prefer to have a payment due within seven days, while others work with a net 15 or net 30-payment schedule. You will also need to detail what happens in the event a payment is late, such as if interest is charged and at what point cleaning services will be suspended. In this section, you can detail practical aspects of what the client is allowing you to do on their property to carry out your duties. It can include the fact they are allowing you into the space and at which times, which are important details to cover if alarm and other security information have been shared or if they are providing storage for your cleaning equipment and similar information. Everyone loves happy clients all of the time, but that’s often not the reality, and you should make provisions for it when creating commercial cleaning contracts. Detail how long they have to issue a complaint after service has been completed and that you will investigate promptly and handle it professionally. Property damage is a real possibility considering the type of work and should be covered in the terms and conditions. Your liability should be limited to instances where your company was at fault, and the amount should depend on what you’re able to recover from your insurance company. The last thing you want is a business trying to poach your cleaning staff and use them for a lower rate, so make that evident in your monthly cleaning contracts that this would indicate a breach of contract. You should also include provisions in your employment contracts that prevent them from offering cleaning services to your clients. There are wide ranges of potential disputes or legal issues that can arise when you provide commercial cleaning services. If your business is professional and your employees are well trained, then there is rarely an issue, but in the case that there is an issue, you need to address it in your commercial cleaning contract. Some find it benefits them to have a three-step process to resolve disputes. Initially, the senior executives for each business can try to work it out and if that’s unsuccessful, then to mediation, and finally, the courts can get involved, if necessary. Your commercial cleaning contracts are legally binding documents, so it’s important to include all of the information you feel is important to protect your company and your clients. If there are issues, you will always have the contract to refer to, and they can really help avoid problems as you grow your business. If you’d like to learn more about commercial cleaning contracts or would like to know how you can have your own commercial cleaning franchise, get in touch with the experts at JAN-PRO today.